Scrumptiously crunchy oat clusters with sweetened cranberries, raspberries & strawberries. 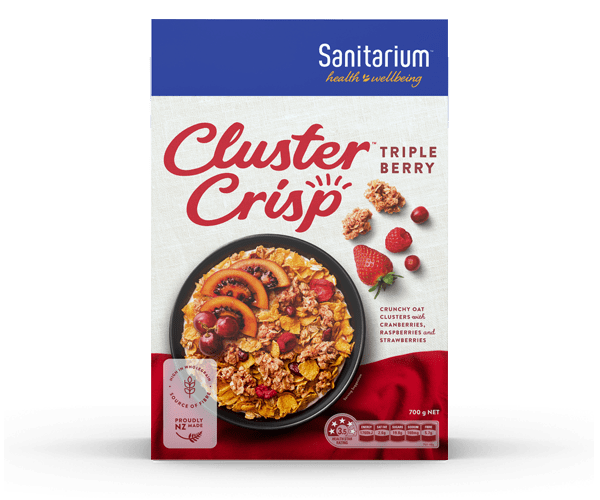 Cluster Crisp Triple Berry is now available in a big value 700g pack - big enough to share with your whole family from Sanitarium New Zealand. Cereals (68%) [wholegrains (46%) (oats, rye), corn, rice, corn meal], sugar, vegetable oils [sunflower oil, palm oil, emulsifier (sunflower lecithin), antioxidants 304, 307b], corn maltodextrin, dried berries (2%) [cranberry, strawberry, raspberry], golden syrup, humectant (glycerol), raspberry juice concentrate (1%), salt, acid (citric), barley malt extract, natural flavour, mineral (iron), vitamins (niacin, thiamin, riboflavin, folate). Contains cereals containing gluten. May contain milk, sesame, soy, sulphites, lupins, and tree nuts.